State Board/Commission/Council: Minnesota Territorial Centennial Office; 19?? to 19?? Judicial Administration: United States Circuit Court (Law Librarian for Judge John B. Sanborn); 19?? to 19?? He was of Yugoslavian ancestry. 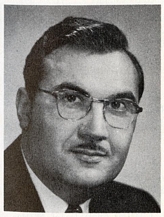 He ran unsuccessfully for the Minnesota Legislature in the 1950 election. He contracted polio in the late 1940s. He was Vulcanus Rex in the St. Paul Winter Carnival in 1952. He died of multiple organ failure at Midway Hospital in St. Paul, Minnesota. His funeral was held at St. Francis of Assisi Catholic Church in Lakeland, Minnesota. Religion provided by Minnesota History, Fall 2008, p. 104. "In Remembrance." Session Weekly, St. Paul: Minnesota House of Representatives Information Office, April 5, 1996, p. 26. "Former Chief Justice Peter Popovich Dies (Obituary)." St. Paul Pioneer Press, March 30, 1996, p. 1B, 5B. Zack, Margaret. "Peter Popovich Dies at 75 (Obituary)." Star Tribune, March 30, 1996, p. A1, A9. Minnesota Supreme Court. "Peter S. Popovich." Biographical Sketches of Justices of the Minnesota Supreme Court and Judges of the Minnesota Court of Appeals from Territorial Days to 1990, St. Paul, Minnesota: West Publishing Company, 1990, p. 33. Files of Chief Justice Peter S. Popovich, 1966-1991 (bulk 1987-1990) - Available in the Minnesota Historical Society's Collections.